Republican candidate for California governor John Cox didn’t say whether he supported the appointment of Brett Kavanaugh to the U.S. Supreme Court. Cox said during a debate Monday that he’s focused on California issues and is “not going to get into the middle” of the appointment. Cox says the allegations of Christine Blasey Ford deserved to be heard. She says Kavanaugh assaulted her at a party when both were in high school. Kavanaugh denies the allegation. Democratic candidate Gavin Newsom says Kavanaugh is going to play a major role on issues that matter to California such as reproductive rights. He opposed the nomination. California’s Democratic candidate for governor is highlighting his Republican opponent’s similarities to President Donald Trump on immigration and environmental policy. Republican John Cox advocated for repealing California’s so-called sanctuary state law that limits cooperation with federal immigration authorities during a debate Monday with Democrat Gavin Newsom. Newsom says the law protects immigrants and keeps communities safe. He used Cox’s opposition to the law and support for building a border wall to draw parallels with the president, who is unpopular in California. On environmental policy, Cox said he thinks California needs to consider the economic costs of fighting climate change. Newsom, meanwhile, worked to tie Cox to Trump’s decision to withdraw the United States from an international climate agreement aimed at reducing emissions. California’s two candidates for governor split markedly on criminal justice issues in their first and only debate. Republican John Cox on Monday opposed new laws that open up police records, criticized departing Democratic Gov. Jerry Brown and says he would concentrate on keeping guns out of the hands of the mentally ill over other gun control measures. Cox also urged the media to stop publicizing the names and photographs of mass shooters. Democrat Gavin Newsom says Cox’s proposals hide his opposition to gun control. Newsom would expand on Brown’s criminal justice reforms. The candidates also clashed on California’s recent decision to eliminate of money bail. Newsom says the old system harms the poor and racial minorities. Cox says doing away with it eliminates the bail industry. The candidates for California governor are highlighting different strategies for building more housing. Republican John Cox said during a Monday radio debate that he would change environmental regulations. He says as governor he would cut back on those regulations to make housing construction cheaper and faster. Democrat Gavin Newsom points to tax reform as a way to spur local governments to approve more housing. He says he would try to change laws that limit property tax revenue for cities because he said they can act as disincentives for housing construction. Cox also says it’s important to maintain local control over housing while Newsom emphasizes creating statewide housing goals. Both emphasized the importance of increasing the rate of housing construction as the state faces a severe shortage. Both candidates for California governor both say affordability is a central issue in the race. Democrat Gavin Newsom and Republican John Cox said Monday that the cost of housing is a serious problem that the next governor must address. The two are participating Monday in their only scheduled debate. Newsom says California is both the richest and poorest state, and the state must to a better job addressing inequality. Cox says Californians should live in a state where they can afford to buy a house or pay their rent and not encounter homeless people on the streets. He blames Newsom and interest groups in Sacramento for driving up prices. The two men hoping to be California’s next governor are preparing to meet for what’s likely to be their only one-on-one debate. 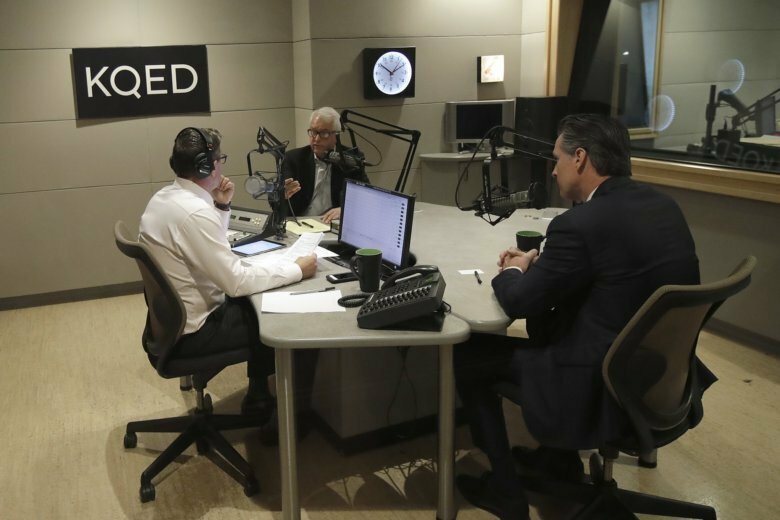 Republican John Cox and Democrat Gavin Newsom will debate Monday morning at San Francisco public radio station KQED. The hour-long session will not be televised but will be offered to radio stations to broadcast around the state. The debate will be a crucial opportunity for Cox to get his message out or try to trip up Newsom. He has trailed Newsom in polls and fundraising. The impact from a radio-only daytime debate could be limited, though. Cox is a lawyer, accountant and investor from the San Diego area who has never held elected office. Newsom is California’s lieutenant governor and former San Francisco mayor.